Hot dip galvanizing significantly prolongs the life of mild steel. We all know that steel is prone to rusting so protecting it with a long lasting, durable and maintenance free coating offers peace of mind and saves you money. The level of Sulphur dioxide (SO2) in any particular environment usually determines the atmospheric corrosion of zinc. Over recent decades pollution has reduced resulting in much lower levels of SO2 in the UK. Studies have shown that the atmospheric zinc corrosion rate in the UK is usually between 0.5 to 2 microns per year. 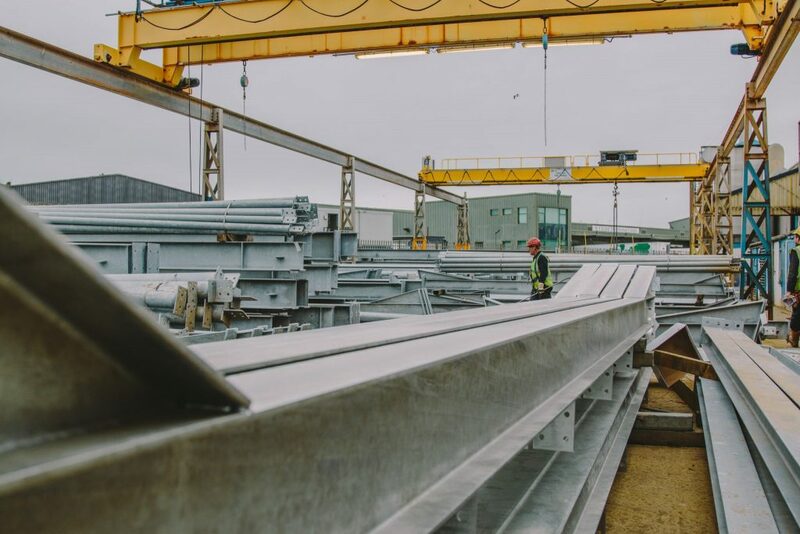 A 6mm thick galvanized section, for example, should achieve an average minimum zinc coating of 85 microns (to conform to the British standard). Therefore, the galvanized coating on a 6mm thick section should last between 42.5 and 170 years. Other localised factors such as humidity, chemicals, salt and proximity to other building materials, etc will influence corrosion rates too so if you require an approximate design life for the galvanized coating on your fabrication then please contact us for more details. For very aggressive environments a thicker zinc coating can be achieved by grit blasting steelwork before galvanizing. This process can potentially increase the coating life by up to around 65%. Hot dip galvanizing is simple and effective. Unlike paint systems, the galvanizing process actually bonds the zinc with the steel to form a coating that is very durable. Galvanized steel is therefore quicker and easier to transport, handle and erect with much less risk of damage on site. The physical performance of a galvanized coating is primarily down to the hard layers of zinc-iron alloys that form during the dipping process. These zinc-iron alloys form underneath the outer shiny zinc layer of the coating and are often even harder than the steel itself. The ‘dip’ in hot dip galvanizing is the key word here. Galvanizers dip the steel into molten zinc and so all surfaces of your fabrications, both inside and out, are coated and therefore protected. Other sprayed coatings can only coat those areas that can be seen and accessed. Rusting can occur on the inside surfaces of a fabrication just as easily as the outer but with hot dip galvanizing you can rest assured that this is not an issue. A bold statement and one that does need clarification, perhaps ‘maintenance freer’ would be more accurate (if not grammatically correct). In addition to the natural physical and corrosion resistance of a galvanized coating it also offers another benefit. Scratches in a painted coating will require immediate maintenance to seal the damaged area and prevent rust creeps under the surrounding paint. Zinc however, corrodes in preference to steel and therefore sacrifices itself to protect the steel. These corrosion products will deposit on the exposed steel resealing it from the atmosphere and thus helping to prevent further corrosion. If it is accepted that mankind needs steel (to make its endless appetite for machinery and buildings etc) and that steel needs to be protected from corrosion, what better sustainable solution to use than zinc. Zinc is a naturally occurring and recyclable substance that is not harmful to us (remember that our bodies actually need a small amount of zinc to live healthily) and helps steel last a very long time. Vulnerable steelwork that is not galvanized will require much more maintenance and will need replacing much sooner. A combination of regular maintenance and shorter life cycle will generate quite a carbon footprint.